Initially the report just lists out every pizza served by Pizza Express (as of March 2019). 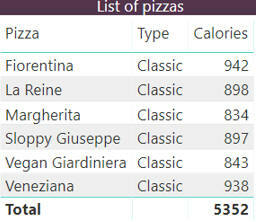 Limit your choices to pizzas having up to 1,000 calories. Make your slicer horizontal, and select Classic. It's surely got to be a Sloppy Guiseppe! Save this report as Slicer Pizza, then close it down.